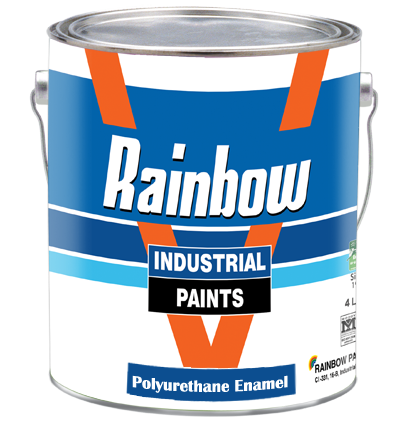 Rainbow Polyurethane Enamel is a high gloss and extremely durable enamel for interior and exterior surfaces. Polyurethane enamel has excellent colour and gloss retention. This is specially recommended for coastal areas on concrete, steel & wooden surfaces. Smoothen the surface by sand paper and apply a coat of Rainbow Synthetic under Coat followed by filling. After filling is dry sand paper the surface and apply 2 coats of P.U.E In case the oil is coming out from the wood, remove oil by scraping and seal the oily portion by shellac solution prior to final painting. Remove all the rust by sanding, rust removing solution or by flame, then apply one coat of Red Oxide Primer, Followed by 2 coats of Rainbow polyurethane Enamel. Composition: Based on polyurethane resin (Single Pack). Covering Capacity: 16-18 Sq Meters /Ltrs./Coat. Film Thickness: 25-35 Micron per coat. Application: Brush, Roller, Spray. Number of Coats: At least 2 coats should be applied for proper finish and durability. Thinner: Mineral Turpentine should be used for application depending on the Substrate and method of application. Packing: 0.91, 3.64 and 14.56 Ltrs. Note: The above Information is given in good faith, but without any Warranty.